The star green technology investor calls for choosing scalable and energy-efficient technologies over "greenwash" in the fight against global warming. Vinod Khosla doesn't like to think of himself as an environmentalist – at least, not if it gets in the way of taking practical steps to reduce carbon emissions to combat global warming. So in his Tuesday presentation at the AlwaysOn GoGreen Conference in Sausalito, Calif., the well-known green technology venture capitalist urged people to concentrate on what he called a "war on coal, war on water and war on oil," rather than, say, incremental efficiency advances in solar cell efficiency. Particularly if those solar panels are being installed in foggy San Francisco, he added. "San Francisco loves to show off its solar panels on its Moscone Center," Khosla told Tuesday's audience of green technology executives and investors. "It should rent the roof of the San Jose Convention Center and get 30 percent to 40 percent more output." "Or move (the panels) to the Mojave Desert," he added. "That would be real." What else is real to Khosla, a co-founder of Sun Microsystems and founder of Khosla Ventures? Well, there's "carbon-negative cement," for one, he said. Coming up with manufacturing processes that can reduce the cement industry's carbon footprint could represent a major step against global warming, given the cement industry's place as one of the top emitters of carbon dioxide, he said. Or there's glass that can shift from letting in sunlight to heat buildings in the morning to reflecting that light in the afternoons to keep temperatures cool, Khosla said. 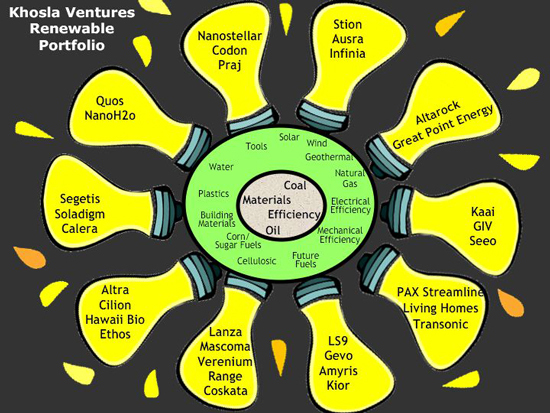 Khosla Ventures has invested in a wide array of companies, including corn-based ethanol makers Altra and Cilion, cellulosic-ethanol companies Range Fuels, Mascoma and Coskata, concentrated solar-thermal company Ausra and geothermal power company AltaRock Energy (see portfolio chart here). 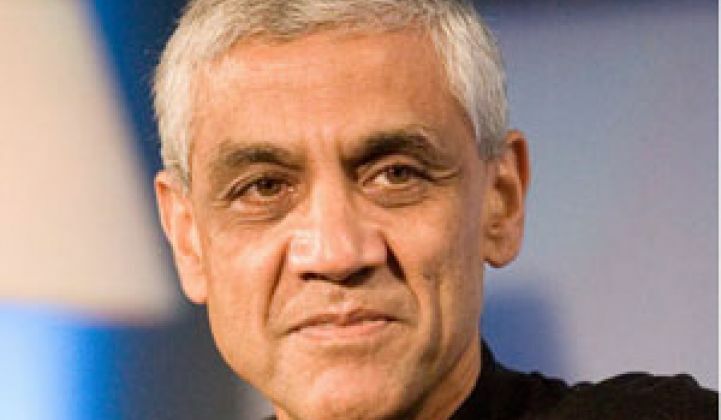 Khosla declared himself a pragmatist when it comes to biofuel investments. He said corn-based ethanol, which critics say has driven up food prices, can make meaningful reductions in carbon emissions. "Having said that, I'm not a big fan of corn ethanol from a scalable perspective," he said, noting that it's unlikely to provide enough fuel to make a dent in the world's demand for transportation fuels. Still, he said, the U.S. corn-based ethanol industry has paved the way for future cellulosic ethanol companies to pick up where corn ethanol will leave off – and he said he believes that those next-generation biofuel technologies will be able to "disrupt the markets" without leading to environmental degradation. Khosla's optimism on ethanol is hardly surprising, as Khosla Ventures has made significant investments in the industry. Critics of cellulosic ethanol, on the other hand, have argued that planting switchgrass or other non-food feedstock will cause more land being diverted to growing fuel crops instead of food. Khosla also believes that batteries for hybrid or electric cars must see big improvements before they can serve as a widely adopted technology that will lead to carbon-reduction gains that can match those promised by new biofuels (see Khosla Calls Plug-In Cars "Toys"). On the other hand, he dismissed the idea of replacing gasoline with natural gas, calling it a "dead end" solution, given its continued use of fossil fuel. "To me the key question is, what's greenwash, and what's really going to change carbon emissions on the planet?" Khosla said before his presentation. "I care about scale, and worldwide adoption of these technologies." Khosla said he supports environmental ratings for biofuels and creating a global carbon cap-and-trade system. "In the end, it will be innovation that solves the problem," he said, whatever the technology involved. "If it's cheaper than the fossil alternative, we don't need regulation to get us there. And I expect we will get there fairly quickly."